Betcha didn’t know…there’s a Pizza Fest going on…ATX Gluten Free is hosting a virtual pizza party and if you’re lucky enough to be in the Austin area, there is a real live pizza fest happening too! Be sure to hop over to Jess’s site to get the details and lots of GF pizza ideas and reviews! We love pizza here. We had it for Valentine’s Day! Pizza = Love, right? Over the years we have tried a variety of crusts and are always looking for more options. We haven’t found our gluten free holy grail, yet.I personally grew up on Pizza Hut and love thicker, yeasty crusts. But being gluten free, my go-to crust has always been to use the Chebe Bread Mix. It has been the one my husband and I agree upon. Lately though, I have been experimenting with crusts and this week was no different. We have used many other mixes as well as the recipe for Crusty Boule from Healthy Bread in 5 Minutes a Day which is very tasty. These days I have been looking for a “healthier” crust, perhaps with some whole grains included. Since I recently adopted Kate over at Gluten Free Gobsmacked, I have been browsing around her recipe list and when I remembered that Pizza Fest was coming up, I tagged one to try. And this week, since I was out of Chebe and was thinking healthier… this one sounded quick and fairly simple, and PLUS I had all the ingredients. Well, mostly. I did sub some things… For instance, I used 1/4 cup + 1 Tbsp brown rice flour, 1/4 cup sorghum flour and 1/4 cup amaranth flour instead of the 3/4 cup + 1 Tbsp brown rice flour she listed. As well, I added one teaspoon of sage to the batter instead of her suggested additions because of the toppings I was using. 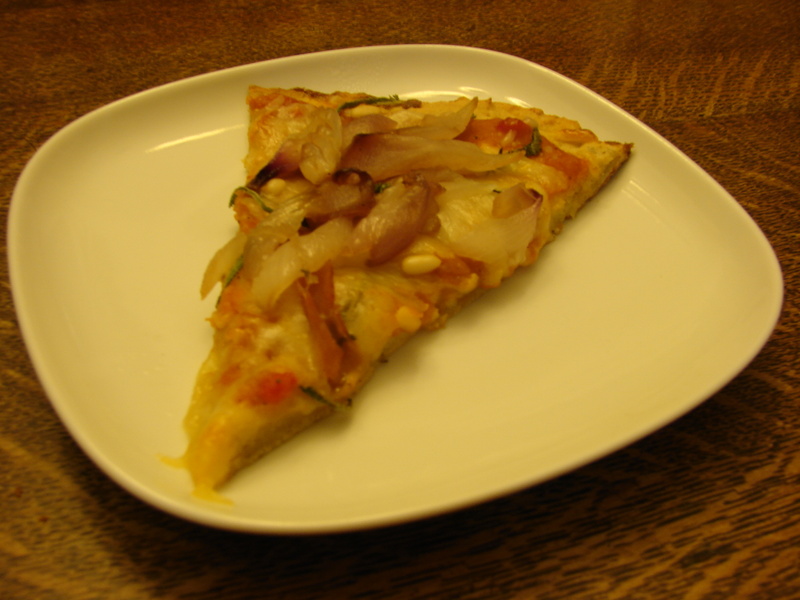 Although next time I will try her herb mix when I make a more traditional flavor of pizza – love those fennel seeds in and on pizza! So, what you see below is Kate’s crust with a few minor adaptations. It was very tasty! Next time I might try spreading the dough on a piece of parchment paper and then placing it on my heated pizza stone (dedicated GF) for a crisper bottom. I have made this variation of a pizza a few times now and multiple times I have forgotten the one key ingredient – carmelized onions. Be sure to include them on yours as they really make the whole pizza sing. I also think some roasted broccoli would be good here too. Partially bake your pizza crust. Add onions and cheese. Bake for a few more minutes, then add pine nuts, sage leaves and prosciutto. Return to oven to bake a bit more. Enjoy! I love this flavor combo! What’s your favorite pizza topping combo? Check out the other links over at Real Food Weekly at The WHOLE Gang. This recipe is also cross-posted over at Gluten Free Easily’s Virtual Support Group. Check it out. Wow that’s an interesting combo of ingredients and flavors. Thank you for sharing it on Real Food Weekly. I hope you like back.